mSupply is designed for situations such as a central supply facility within a country or region, or within a hospital where the supply of stock to customers is controlled by the supplying facility. That is, supply of stock to customers is managed by the supplying store. Both the imprest and stock history methods require a stocktake of the customer's stock. The items to be included in the customer's stocktake is defined in lists which are specific to each customer, and must therefore be individually compiled, however, they can be based on master lists. Master lists and local lists and how to create and assign customers to them are covered elsewhere. Lists are defined for each customer in the Edit Customer window. Click on Item lists in the side bar menu. 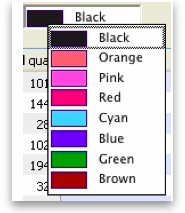 This displays the window in which you create the required lists. First, click on Add local list and in the panel that appears, enter a name for your list then click OK - in the example we've named it Items_Imprest. Select the list to highlight it, and you're ready to compile it. Click on Add item to do this, and repeat until you've added all the items you require. Our example (below) shows that one item (Ibuprofen) has been added, and a second item (Prednisolone) is being added. Only if you are using the the imprest method is it necessary to enter imprest quantities. If you are not using the imprest method, the Imprest Quantity field should be left blank. We'll now add another item, Haloperidol 5mg tablets, with an imprest quantity of 200, to demonstrate how it's done. Click on the Add item icon to bring up the standard search window. Type the first few letters: hal, followed by the Tab key. From the list, select: HALOPERIDOL TABS 5MG by double clicking on it. The Add item window appears. Enter 200 in the Imprest Quantity field. The theory behind the stock history method (sometimes referred to as the Historical Logistics Method) is based on the assumption that future customer usage will be similar to historic usage. We can calculate the customer's average usage over time if we know their stock levels at two points in time, and what stock they received from us in that intervening period. We assume that this average usage rate will continue over the coming supply period. mSupply uses stock issued by the supplying store to arrive at the parameter B. Obviously, if the customer has received goods from other sources during the calculation period, B will be inaccurate! In order to calculate the usage rate, mSupply requires stock on hand figures of the items on the list recorded on an earlier date (date1) = A, above. This becomes the initial stock history record. Enter the date as the correct date at the time the stocktake was performed. Ignore the figures that automatically appear along each row, except for the Their current stock column. Close the window using the OK button. Once your customer's first stocktake record has been entered, and a period of time has passed with some customer stock usage, re-supply can be be generated on the basis of this usage. A re-supply using the stock history method needs to be triggered by a customer stocktake. If your customer is set up with mSupply customer web interface, then this process can be initiated by the customer directly, and then completed in the supplying store as described below. If your customer has not used the mSupply customer web interface to report their stocktake, then their stock data needs to be entered in manually to the supplying store. Double-clicking on a line will allow you to edit the selected record (provided that you have permission to do so). Enter the first few letters of customer's name in the Name field, then press the Tab key to call up the list of customers' names from which the required customer may be chosen. In this example, our customer is Medical Ward. The Our SOH column is the stock on hand in our own store, while figures in all subsequent columns are the customer's data. The first entry to be made is in the Days to supply field, where the appropriate figure should be entered - e.g. 30 if the ordering frequency is monthly, 90 if it is quarterly, etc. The column headed Their current SOH is the column where the customer's current stock figures (as provided by the customer) are entered. But note that, just as with the imprest method, if the name you entered in the Name textbox is actually another store then this column will be automatically filled in with the current stock in the store - saving you a lot of time (you only need to edit those figures where the stock in mSupply does not actually match what's on the store's shelves). As figures are entered, mSupply® calculates a suggested quantity to order, and this appears in the Suggested quan column. These suggested quantities should be reviewed, and any adjustment entered in the Actual quan column to reflect, for example, pack sizes and to ensure that actual quantities match exact multiples of the pack size. All that remains is to make adjustments in the Actual quantities column, to reflect appropriate pack sizes. Once you are satisfied, the Confirm box (bottom left corner) should be checked, the Create customer invoice button should be clicked, and you will proceed to creating the customer invoice, which is the same for all requisition types. 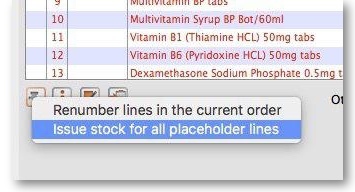 Customer stock takes: This form you can give to the customer (for example, if they are a ward in a hospital that has mSupply running in it's pharmacy store), and they can fill out the quantities they have on hand, and then values are entered into mSupply. Customer stock supply: This form provides information to give to the customer about the quantity they will be supplied. Customer stock request and issue: This form provides information for the customer comparing what was requested with what was actually supplied. The second two reports are for use after you have entered quantities to be supplied into the customer stock history window. The Imprest method is probably the most commonly understood and used method of stock control, and has been used for many years, probably since before the invention of the computer! D = Quantity used in period between date1 and date2. If stocktakes are not taken at the pre-determined frequency, and particularly if they are missed, the system will fail. It is a fairly rigid system, in that once set, F, G and H must remain constant. It is frequently used for supplying wards in a hospital setting, where operations are generally more controllable. The stock of a particular item which a customer (usually a clinic, ward or department) should hold is agreed. This is the Imprest quantity. A stocktake is carried out at the facility, giving us a Stock on hand. It is agreed that the clinic, when fully stocked, should hold 10,000 paracetamol 500mg tablets. This is the Imprest quantity. At the end of a particular month, a stocktake shows that the Stock on hand is 2,400 paracetamol tablets. This feature caters for mSupply users who operate an imprest system, where a central store supplies goods on a regular basis to a number of customers, who may/may not be mSupply users themselves. We advise that the customers should be provided with a list - perhaps for a 12 month period - of the dates on which they should perform a stock check and submit the figures, ideally on a customised form, to the central store acccording to the prearranged schedule. It is important to note that the customer needs to supply only the current stock on hand figures, a relatively simple task; customers are not required to submit details of what they perceive to be order quantities. It should be remembered that the items to be included in the list and their imprest quantities must be defined for each customer individually. The imprest quantity defined for a particular customer is unique to that customer, and has no bearing on imprest quantities defined for other customers. If you are working with a customer for whom no imprest list has been defined, clicking on the New customer imprest will display the Enter new imprest window, where appropriate entries are made. You will note that there are no entries in the Their current stock column, and the figures supplied by the customer should be entered; click on each line, and after a second or two the zero appearing in that column can be edited with the required figures. There is an important exception here: if the name you entered in the Name textbox is actually another store in mSupply then the Their current stock column will be automatically filled in with the stock in the store. Very useful time saving feature! Selecting 5 or more lines brings up an alert requiring confirmation of your intention. Once you are satisfied, the Create customer invoice button should be clicked, and you will proceed to creating the customer invoice, which is the same for all requisition types. It is possible to generate multiple customer invoices from a single response requisition e.g. if not all of the requested stock is available at the time the requisition is entered, this allows for an initial customer invoice to be sent to partially fulfil the request and another to be sent at a later date when more stock becomes available. It provides a more accurate way to track demand vs supply. A response requisition will be automatically created in the supplying store as a result of a request (supplier) requisition from mSupply mobile (see here for details) or an internal order from another store (e.g. on another mSupply syncing site). In both of these cases, the customer is another store and most of the data will have been entered already in the customer store. It doesn't attempt to calculate usage or suggest an amount to supply - this data is expected to have come from the customer. Enter/update the customer Name in the same way as a customer stock history (i.e. enter the first key characters and hit the Tab key to find matches), but note that changing the customer will invalidate any other data that you've already entered. If necessary, update the Requisition date and Order received - these will default to the current date. Use either the New line button to manually add a single item, or Add from master list to add any items in the customer's master list which are not there already. If the customer is another store, mSupply already knows their current stock, otherwise adding a single item will give you the opportunity to enter the customer's current stock for that item. Either way, the cursor will go into the Customer current stock on hand cell, which will already be filled in. If adding from a master list, the cursor will go into the first new item's Customer current stock on hand cell, but you'll then have to type in a value (unless the customer is another store, in which case the value will have been filled in for you). Either way, hitting the Tab key will move the cursor into the Customer requested cell. Type in a value and this will be automatically copied to the Remaining to supply cell and also the Supply this invoice cell, which will now have the cursor. Amend the Supply this invoice value if necessary and optionally enter a Comment (e.g. if the amount supplied is less than requested). If necessary, use the Delete line(s) button to remove selected item lines. The customer Name is already filled in and cannot be changed. The Customer current stock on hand and Customer requested columns are already filled in and cannot be changed i.e. only the Supply this invoice and Comment columns are editable. If necessary, you can still add and/or delete item lines manually. Note that, while a filter is active, some of the other buttons are disabled e.g. you can't create an invoice or save the sort order unless all lines are visible. Once you are satisfied, the Create customer invoice button should be clicked, and you will proceed to creating the customer invoice. The Supply this invoice values will be used to populate the new customer invoice and the requisition status will change to confirmed. Clicking on the “Finalise Checkbox” finalises the requisition form. After this no changes can be made. Finalised requisition form will no longer appear on reports that show “Remaining Quantities” as pending. Finalised requisition will be considered as fully processed. The Already issued column will be updated to reflect any non-placeholder lines (i.e. those not coloured red in the customer invoice) in any customer invoices which have been generated from the requisition regardless of the customer invoice status (i.e. it doesn't have to be confirmed). In the example above, a single customer invoice has been created to supply most of the requested stock, apart from two items. You can then create a second customer invoice to supply the outstanding amounts. Double-clicking on any of these lines will open the corresponding customer invoice. If the customer invoice has been generated from an original internal order in another store, the customer invoice window will have a red Stock transfer label. Similarly, if the customer invoice has been generated from an original internal requisition in another store, the customer invoice window will have a red Internal requisition label. Press the grinder icon at the bottom left to issue stock for all placeholder lines. All the entries appear in red, as mSupply needs the operator to select the specific item to be supplied from your store, i.e. the batch required, and, if necessary, to distribute the order over two or more batches, if there is insufficient quantity of one batch in your store. The next step is to double click on each entry and in the example, the 1st item on the invoice, Ibuprofen 200mg tablets, is being processed; there are several batches in our store, some of which have reached their expiry; although line 4 indicates there are sufficient to meet this order in the store, you will note that only 106 tablets are available, so we select line 6. Clicking on OK & Next displays the next item on the invoice, Prednisolone 5mg tablets. Click Redistribute all, which is the normal procedure. There is only one batch available, but there is insufficient stock to meet the order, so mSupply® creates a placeholder line for the outstanding amount. When the final item has been processed, clicking on OK will display the completed invoice. Make sure the Hold checkbox is not checked, and at this stage the invoice may be confirmed. Obviously, regardless of the calculation method employed, if the supplying store fails to re-supply the customer within the supply period (G) then the customer will start eating into the buffer stock and is in danger or running out of stock!